Pioneers in the industry, we offer hvo-1000md medical recorder, hvo-550md medical recorder, hvo-500md hd medical video recorder usb/nas, image multiplexer, 3d hd video recorder hvo-3300mt and 4k 3d medical video recorder from India. Every aspect of the HVO-1000MD is aimed at optimising critical time during medical procedures while capturing outstanding video and images. 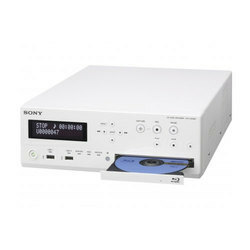 It has simple controls and can record to multiple media formats simultaneously. 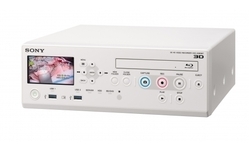 Although primarily a high definition medical video recorder, the HVO-1000MD is also a multipurpose delivery device, capable of streaming video to conference rooms and lecture theatres, and distributing content on a wide range of recording formats - including Blu-ray. The efficiency continues through the entire workflow, as media recorded on the HVO-1000MD is easily transferred to widely-used video editing systems such as Sony’s Vegas and Apple’s® Final Cut Pro. The HVO-1000MD medical video recorder: simple-to-use HD recording for an efficient all-HD workflow. This recorder offers quality recording from high and standard-definition sources. Multiple bit rates available to suit a variety of storage and delivery requirements. MPEG-4/H.264 AVC compression is used throughout, for extremely detailed images and compatibility with editing systems and playback devices. Maximum usability through an extremely simple and accessible user interface. The HVO-1000MD can record still and moving images. While the HVO-1000MD records to its built-in hard drive, it can also record to a variety of optical media, including Blu-ray. USB storage peripherals are also supported. 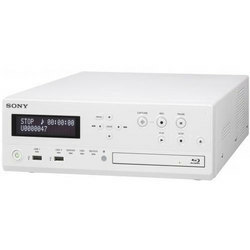 Real-time streaming option in conjunction with Sony’s NSR network security video recorders. With a choice of bitrates and storage media types, the HVO-1000MD is capable of extended recording times. The HVO-500MD stores HD or Standard Definition video on its high-capacity internal hard disk drive. Via simple menu selection, video can be recorded at the same time to an external USB drive or a network server. This simultaneous recording capability saves time, eliminating the need to export or copy video files to another storage medium after recording. It also provides an extra safeguard against the risk of losing valuable data. 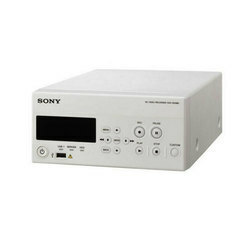 Sony’s VMI-40MD Image Multiplexer is intended to provide a single integrated image from multiple video sources in the operating room. The VMI-40MD enables medical experts to view up to four images, such as those from surgical cameras, diagnostic information, and other medical images, simultaneously on a single display screen. This versatile image multiplexer supports a variety of inputs and outputs for flexible operation. 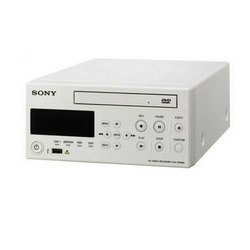 Furthermore, this unit can be connected to a digital video recorder to record or capture video and vital data simultaneously for documentation. Successor to the popular HVO-1000MD and HVO-3000MT recorders, the HVO-3300MT is capable of recording 3D or 2D images with Full HD resolution from a connected modality onto its high-capacity internal hard drive. Video footage can also be stored simultaneously on up to two external media devices, including Blu-ray Disc/DVD, USB memory or a hospital server for easy sharing. In addition, live video captured by the HVO-3300MT can be streamed directly to consulting rooms, offices and other locations outside the OR. Compliant with latest medical safety standards, the recorder features a compact design that's both smaller and lighter than the previous-generation HVO-1000MD and HVO-3000MT, allowing easy integration in a medical cart. The HVO-4000MT is a 4K, 3D and 2D medical grade video recorder that's intended to record 4K video and still images from endoscopic/laparoscopic camera systems, surgical microscope and other compatible imaging systems.Images captured with the HVO-4000MT can be used for patient records, training or educational purposes. The compact, portable recorder is suitable for use in hospital operating rooms, medical imaging centres, surgical centres, clinics, doctor's offices and similar healthcare environments. The HVO-4000MT offers a long time recording on its internal hard disk drive Recorded videos can be exported to an external USB hard drive, flash memory or CIFS server via hospital networks for storage, sharing with other consultants and teaching purposes. HVO-4000MT is designed to comply with medical safety standards and is optimised for medical applications. This equipment is intended for use by qualified medical professionals only. From patient records to education, training and referral to other physicians, modern medical workflows benefit from the increased convenience and detail offered by HD video recording. 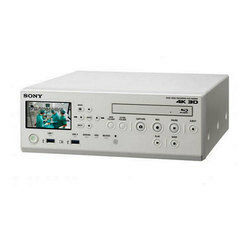 The HVO-550MD Medical Digital Network Recorder has been designed for use in a wide range of clinical environments, including hospital radiology and operating rooms, surgical centres and doctors’ offices.Suitable for storing High Definition videos from ultrasound, digital X-ray, endoscopic, laparoscopic and other compatible diagnostic and surgical imaging systems, the recorder offers extensive connection options with a wide range of current and legacy devices.The HVO-550MD stores HD or Standard Definition video on its high-capacity internal hard disk drive. Via simple menu selection, video can be recorded at the same time to an external USB drive or network server, or burned directly to the recorder’s internal DVD drive. This simultaneous recording capability saves time, eliminating the need to export or copy video files to another storage medium after recording. It also provides an extra safeguard against the risk of losing valuable data.The recorder is the ideal replacement for the DVO-1000MD. Sharing the same command set for control via RS-232C or USB, it offers a smooth migration to a hard -disk-based HD workflow. The HVO-3000MT video recorder lets clinicians capture high quality 3D images acquired with the MCC-3000MT Video Camera – or other compatible 3D cameras – in Full HD. Documenting surgical procedures in stereoscopic 3D provides a richer visual experience that’s closer to natural sight than 2D imaging. Surgeons, operating room staff and consultants can view procedures with improved depth perception and spatial orientation. 3D video recordings also offer a powerful teaching tool, giving students a stereoscopic view of complex procedures. The HVO-3000MT is a medical grade video recorder, capable of recording and playback of both 3D and 2D images. Full HD video images from the MCC-3000MT camera are stored on the recorder’s internal hard disk drive, and can also be stored on removable media including Blu-ray Disc™, DVD or USB memory. 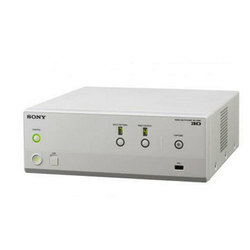 During playback, high-resolution 3D images can be viewed in Full HD on a medical grade monitor such as the Sony LMD-2451MT, or other non-medical professional monitors. Fully compliant with latest medical safety standards, the HVO-3000MT features a compact design measuring just 305 x115.5 mm (W x H) for easier integration in a medical cart. 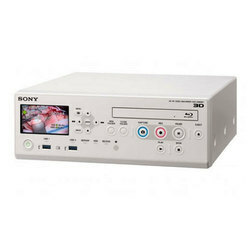 From patient records to education, training and referral to other physicians, modern medical workflows benefit from the increased convenience and detail offered by HD video recording.The HVO-500MD Medical Digital Network Recorder has been designed for use in a wide range of clinical environments, including hospital radiology and operating rooms, surgical centres and doctors’ offices.Suitable for storing High Definition videos from ultrasound, digital X-ray, endoscopic, laparoscopic and other compatible diagnostic and surgical imaging systems, the recorder offers extensive connection options with a wide range of current and legacy devices.The HVO-500MD stores HD or Standard Definition video on its high-capacity internal hard disk drive. Via simple menu selection, video can be recorded at the same time to an external USB drive or a network server. This simultaneous recording capability saves time, eliminating the need to export or copy video files to another storage medium after recording. It also provides an extra safeguard against the risk of losing valuable data.The recorder is the ideal replacement for the DVO-1000MD. Sharing the same command set for control via RS-232C or USB, it offers a smooth migration to a hard -disk-based HD workflow. The HVO-3300MT Video Recorder allows clinicians to capture high quality 3D or 2D images acquired with 3D/2D endoscopic camera systems, surgical microscopes, and other compatible medical imaging systems in Full HD.Successor to the popular HVO-1000MD and HVO-3000MT recorders, the HVO-3300MT is capable of recording 3D or 2D images with Full HD resolution from a connected modality onto its high-capacity internal hard drive. Video footage can also be stored simultaneously on up to two external media devices, including Blu-ray Disc/DVD, USB memory or a hospital server for easy sharing.Enhanced functions compared with its predecessors include a large LCD colour display for reviewing images and adjusting system settings, increased internal HDD capacity, two-channel recording; and simultaneous low-resolution proxy recording via connection to the Sony CMS (Content Management System).Compliant with latest medical safety standards, the recorder features a compact design that's both smaller and lighter than the previous-generation HVO-1000MD and HVO-3000MT, allowing easy integration in a medical cart.This equipment is intended for use by qualified medical professionals. 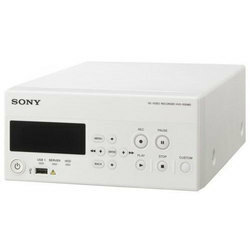 Sony now makes all the advantages of the DVD format available to clinicians who need to record high-quality images. Fully compliant with latest Medical Devices Directive (MDD) standards, the DVO-1000MD is a DVD Recorder that has been designed for use in a wide range of healthcare environments. It allows recording and playback of images from a wide range of visible and non-visible light modalities. Compact, ruggedly-engineered and easy to use, the DVO-1000MD offers all the benefits of removable disc media over S-VHS tape. These include digital image quality and near-instant browsing and access to files, plus low media costs and reduced library space requirements. The DVO-1000MD uses industry-standard MPEG-2 video compression. This allows images to be recorded with high clarity that's required in medical applications while optimising the use of disk space. You can quickly access a desired title or chapter simply by selecting it from a list that is automatically created and instantly displayed simply by pressing the 'LIST' button. These powerful random access capabilities speed up the process of reviewing recordings after and examination. Thanks to the built-in 80GB Hard Disk Drive (HDD), recording begins the moment the REC button is pressed. What's more, the HDD provides even more security for your recordings because you won't lose data in the unexpected event of power outage in recording or damage onto the DVD disc. Adopting the inexpensive DVD+RW format of removable disc media, the DVO-1000MD offers playback compatibility with a wide range of devices. The DVD+RW media is low-cost and eliminates the need for a finalisation process after recording. 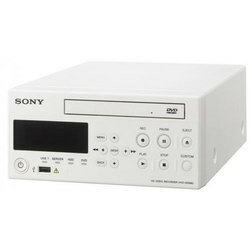 It is also ideal for long-term archiving, as well as giving obvious space-saving benefits compared to VHS tapes. The DVO-1000MD facilitates the recording of patient data on the disc, allowing simpler data management.